In honor of my recent travels to Asia, this month I thought I would focus on a tropical fruit-one not very well known to those in the west, but beloved in some Asian countries, especially in Singapore. This is a large fruit with a spiky thick green exterior and a creamy yellow interior. What is it? Durian. Those who love it really love it, but those who hate it stay far away from it, mainly because of its very strong pungent smell. It is so pungent that there are signs in taxis and on the Mass Rapid Transit (MRT) trains in Singapore warning against bringing durians onboard. I used to hate the smell of durian, but on this trip I tried some of the creamy flesh from a freshly cut durian, and it was actually surprisingly sweet, creamy and not odorous at all. In Singapore, there are an astounding number of durian inspired products: from fried durian, durian mochi, durian creampuffs, durian white forest cake, durian chendol, durian ice-kachang, durian strudel and of course, my husband’s favorite…durian icecream! 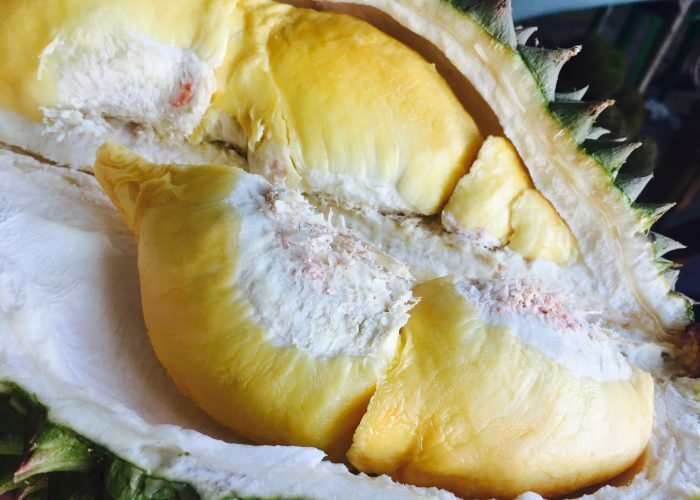 But what’s really in a durian? What are the nutrients—if any? Surprisingly, the United States Department of Agriculture Agricultural Research Service has a basic nutrient report for ‘Durian, raw or frozen’. One cup chopped or diced (243 grams in weight) of durian provides a whopping 357 calories (roughly equivalent to a double cheeseburger from Burger King! ), 3.6 grams of protein, 66 grams of carbohydrate, 9.2 grams of fiber, 1059 milligrams of potassium (equivalent to about 4 ½ raw navel oranges), 0 milligrams of cholesterol and about 48 milligrams of vitamin C (equivalent to about 5 large raw apples with skin). So, should you eat durian? Well, the durian does provide surprisingly high amounts of fiber, potassium and some vitamin C for a cup’s serving. Besides, if you love the exotic fruit’s creamy sweet flesh, it will be difficult to stay away. However given that durian is high on the scale in terms of calories, it may be best to watch your portion size when you indulge in this unique fruit. If you decide to try durian, make sure you try the flesh of a freshly cut one, instead of one that has been already cut for some time, as the flesh might be tougher, drier and less sweet. This trip we gave our toddler some to try, but (to my husband’s disappointment) she wasn’t very impressed!